Not really time for another food post, but i’m working simultaneously on two longer, more serious posts and want to toss something out online tonight since it’s been a week and i don’t want you pigeons to stop pecking. I’ve been in a pickling frenzy recently, starting with the snow peas from Herr’s Family Farm that i mentioned a couple weeks ago. By the way, from their name you might get the idea that the Herr family are some Germans who relocated to California a generation ago. You’d be half right as they moved here from overseas, but they’re not German. It was after a different war, it’s pronounced as if it were spelled ‘hurr’, and they don’t look the least bit German because they’re Hmong. The pickled snow peas went over very well, so i tried a batch of their sugar snaps, which also got a good reception. 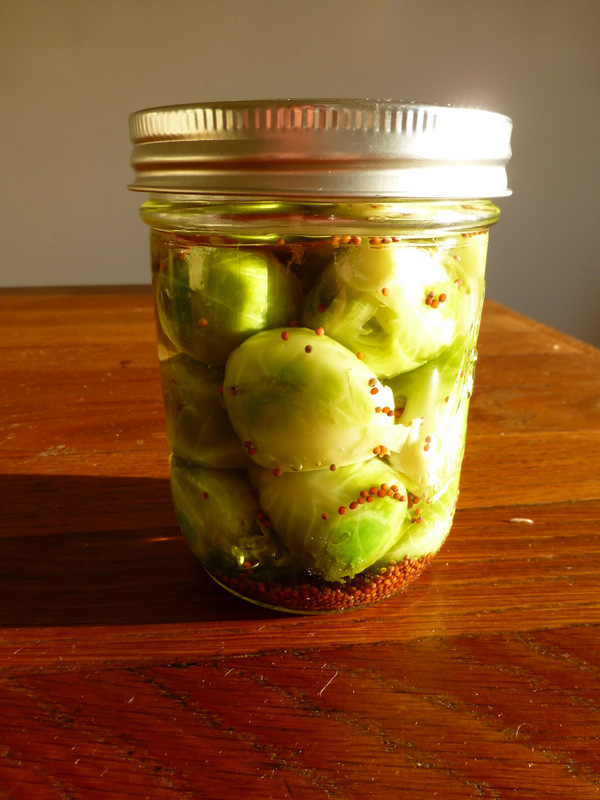 And last Saturday when i was at the Ferry Plaza Farmers’ Market i swung by Iacopi’s stall and looked at his Brussels Sprouts. Just gorgeous. The size of small eggs and hard as rocks. Not a loose leaf on ’em. And yeah, they were priced accordingly but i couldn’t resist. Got ’em home and they were too beautiful to eat so i pickled ’em. They were so perfect that most of them needed hardly any prepping. Iacopi’s sprouts are consistently fine, but i’ve never seen a better looking batch. What i should have done is dumped them out of the bag and photographed them in a pile on the table, but i don’t think fast enough to do stuff like that anymore. Here’s what they look like pickled. The other great food news is that my friend Roy had in his basement five file boxes full of jars with resealable lids, most of which were the pint and smaller size that i use. My friend Stephen is helping Roy lighten ship and brought the boxes over to me. It felt like Christmas. And thanks to Roy and Stephen, i won’t have to buy jars until midsummer, which is better news than it sounds like because little 8 oz. canning jars are now selling for a buck and a quarter each…at the cheapest place in town.